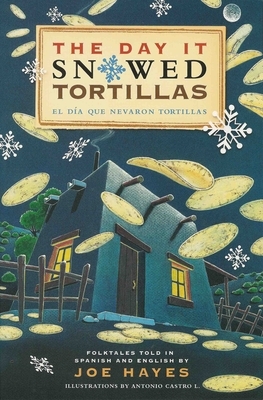 Kids of all ages are always asking Joe Hayes, "How can it snow tortillas?" Well, now they'll know where to find the answer--at long last, Joe's signature book The Day It Snowed Tortillas is appearing in this new bilingual edition. Bloomsbury Review listed the original English-only edition as one of their fifteen all-time favorite children's books. Our bilingual edition has all the original stories as they have evolved in the last twenty years of Joe's storytelling. It also has new illustrations by award-winning artist Antonio Castro. Storytellers have been telling these stories in the villages of New Mexico since the Spanish first came to the New World over four hundred years ago, but Joe always adds his own nuances for modern audiences. The tales are full of magic and fun. In the title story, for instance, a very clever woman saves her silly husband from a band of robbers. She makes the old man believe it snowed tortillas during the night In another story, a young boy gladly gives up all of his wages for good advice. His parents think he is a fool, but the good advice leads to wealth and a royal marriage. The enchantment continues in story after story--a clever thief tricks a king for his kingdom and a prince finds his beloved in a house full of wicked step-sisters. And of course, we listen again to the ancient tale of the weeping woman, La Llorona, who still searches for her drowned children along the riverbanks. El Bloomsbury Review nombr la edici n original de este libro entre sus 15 libros favoritos de todos los tiempos. Cuentistas han contado estas historias en los pueblos de Nuevo Mexico desde que los espa oles vinieron al Nuevo Mundo, hace m's de cuatrocientos a os, pero Joe siempre a ade sus propias matices para audiencias modernas. Los cuentos est n llenos de magia y diversi n. En la historia titular, por ejemplo, una mujer muy astuta salva a su esposo de un grupo de ladrones. Hace que el viejito crea que nev tortillas durante la noche En otra historia, un joven da todo su sueldo, con gusto, por buen consejo. Sus padres creen que es una locura, pero el buen consejo lo lleva a riquezas y un matrimonio real. El encantamiento continua de historia en historia--un ladr n inteligente estafa a un rey por su reino, y un pr ncipe encuentra su amada en una casa llena de hermanastras malvadas. Y claro, escuchamos el viejo cuento de La Llorona, quien todav a busca por la orilla de r os para encontrar a sus hijos ahogados. Joe Hayes is one of America's premier storytellers. He is especially recognized for his bilingual telling of stories from the Hispanic culture of northern New Mexico. Joe lives in Santa Fe, New Mexico and travels extensively throughout the United States, visiting schools and storytelling festivals. Joe Hayes es un cuentista preeminente en los Estados Unidos. Es especialmente reconocido por sus relatos biling es de historias de la cultura Hispana del norte de Nuevo Mexico. Joe vive en Santa Fe, Nuevo Mexico, y viaja extensamente, visitando escuelas y festivales de cuentistas.